(Newser) – For 75 years, researchers have known that opossums aren't fazed by poisonous snakes that can kill humans with a single strike. For about 25 years, they've known that a serum protein is responsible for that immunity. Now scientists have harnessed that protein and hope to save some of the 20,000 people who die from snakebites each year, Gizmodo reports. Experts have synthetically manufactured a peptide—a chain of amino acids from the opossum protein, known as the Lethal Toxin Neutralizing Factor—that has neutralized bites on mice from diamondback rattlesnakes and the Russell's viper of Pakistan. "It appears that the venom protein may bind to the peptide, rendering it no longer toxic," lead researcher Claire Komives explains, per Phys.org. What's even more impressive: The antivenom may also offset toxins from other venomous snakes, scorpions, plants, and bacteria, Komives adds. I probably hate their half shelled cousins even more. They are bold and they do not scare easy. On orienteering trips, I would gather up some hand sized rocks. Usually that would convince them to find another camp to bother. I always told the kids if they needed to do biz at night, don't go near my tent as they will be hit by a rock. Then once I ran out of rocks, it was the SIG-40. But don't worry, always spotlighted them first. Good news, everyone. 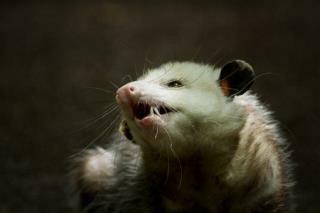 Although I do hope no mice or opossums were harmed in any way. You can have all my possums...since some nice little girl brought them to Portland as a pet during WWIII ship building days, they now infect the whole State. Nasty scarlly things that love nothing more than to fowl up poultry flocks.